A Roma woman in the poor Bucharest neighborhood of Ferentari. My name is Crina Marina Muresanu. I am 21 years old and Romani. I was born in Bucharest. After my father died five years ago, my family and I moved to a poor neighborhood called Ferentari. Most of the people in Ferentari live in dilapidated housing blocks. 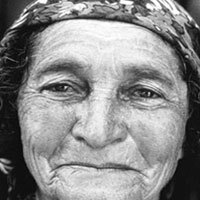 It is known as a Romani community, but not all its inhabitants are Roma. If you ask someone on the streets of Bucharest about Ferentari, they’re not likely to react positively. It probably deserves its horrible reputation: It’s known for its drug dealers, its old, derelict buildings, its stench, its poverty, its unemployment, and its truant children. People live there because the rent is cheap. Despite the fact that Romania has the highest percentage of Roma people of any country in the world, there is still a lot of discrimination against us. You often hear things like “Why do you steal? Are you a Gypsy? Only the Gypsies steal!” or “Why do you use such foul language? Only the Gypsies would say that!” For most of the members of the majority population, “Gypsies” are dirty, foul-mouthed, dark-skinned thieves. When I tell people I live in Ferentari, they look at me askance. But I must challenge the stereotypes people have about my neighbors. Most—Roma and ethnic Romanians alike—have jobs. I am a Rom, I grew up in this area. I go to school, I work, I consider myself to be clean, and I think my family is just like any other. I am not the only one; most of my neighbors fit the same profile. But Ferentari is overshadowed by its problems. I don’t believe that, given the opportunity to work, the average man or woman of any ethnicity would rather go to jail for drug-pushing. I don’t deny that a small minority would choose a path that leads to jail, but most turn to crime for lack of other opportunities. I am not a mother, but if I had a baby, I would do anything to feed my child. I don’t approve of criminality, and I am not making excuses, but this is how I explain the situation to myself. Another problem in the neighborhood is that so many of its children do badly in school, if they go at all. I think the parents are the most to blame: Either they do not have the time to help their children with schoolwork (in Romania, you work 10 hours a day for a meager sum), or they are so burdened by day-to-day worries they have no energy to make their children study. Either that, or they don’t believe education is important. If they’re lucky, their children will work. I live in a two-room apartment with my mother, my elder brother, and my uncle, my mother’s brother. Three years ago, I began to study social work, because I believe it is important to help people in need. I am also working for a nongovernmental organization (NGO) that advocates for the rights of Roma. For me, this is an opportunity to earn money for my family, but it also gives me a chance to learn how I can get involved in improving the condition and image of the Roma. In order to change things in Ferentari, I have undertaken a special commitment, backed by the Împreuna (“Together”) Agency for Community Development. They have provided publicity, advice, and help with the paperwork to get 15 young people into high school and college. Thanks in part to their help, the main school in the neighborhood is now being renovated. When work is over, it will be the most modern school in Bucharest! I envisage a much better future. I have faith that my neighbors who are in school or working will be able to improve life in Ferentari. They are dedicated and work hard. I believe that if you really want something, you can create your own opportunities. And Romania is making visible progress, at least as far as ethnicity is concerned. There are now laws, ordinances, programs, and Romani NGOs fighting discrimination, which gives me and my colleagues much more willpower and strength to carry on with our work. Romania is a very beautiful country—a visitor can’t fail to notice the beautiful countryside, the unique traditions, or the friendliness of the people. But for me, the country has another resource that is even more important. It’s the wish and ability of the younger generation to improve their lives and reach new horizons. Layla Aertes is a Belgian photojournalist who has reported from Kosovo, India, Vietnam, Ecuador, and elsewhere. Crina Muresanu is a young Romani woman from Bucharest.